Prana is life force. It is the creative and intelligent spark of life that animates everything. It flows through channels in our subtle body and infuses our body-mind system completely. When our prana is flowing evenly and undisturbed, we are healthy; prana is balanced and calm. It is ready to respond to the needs of body-mind. It can express as light and quick, undulating, rising, heavy or expansive, inward drawing, or dispersive. All of the inner actions that animate us and keep us alive are movements of prana. Prana spreads through us via the intricate system of the nadis (channels that contain and direct flow). These channels of flow are sometimes felt or described as rivers of light or vitality. The nadis are the pathways themselves, the banks of the river, and the prana, like liquid light, flows along and within the banks. The vayus are the winds, or the directional forces, that propel the prana. Together the vayus support and motivate the various movements of life force that motivate different bodily functions. In other words, the vayus coordinate their movements and balance the flow of prana. When prana flows evenly and healthfully in our body-mind we feel well. When it is obstructed, erratic, overly stimulated, or dull we feel less well. When it flows in a balanced way, prana seeps through the entire body-mind and penetrates like an even mist of vitality. We feel settled and calm. The combination of yoga asana and pranayama does a great deal to balance the flow of prana. The balancing of prana is one of the main reasons that people generally feel better after attending a yoga class. There are said to be forty-nine vayus, ten of which are of major importance. Of the ten, five are considered to be of primary importance. Each of the five vayus has its own qualities and movement. And although, each is centered in a particular region of the body, they are also all present in every cell. Prana is the umbrella term that includes all of its discretely defined directional flows – so; the prana vayus are all movements of prana. However, it is important to understand that one of the vayus is also called prana, and the prana vayu is not to be confused with the unified prana that includes all life force. Since there are many different descriptions of the vayus, and some are confusingly dissimilar, it seems fair to say that each serious yoga practitioner should explore the fascinating world of pranic movement for him or herself. In the descriptions below I have included material that I have read (and is easy to find in yoga texts) with my personal experiences. My hope is that this may prompt you to explore for yourself. I think it’s safe to say that all of the major systems of Hatha Yoga in the west today have something of value to offer. There are excellent teachers from all traditions. And, as we know, there are also some incompetent yoga teachers from all traditions. Each one of the systems has specific tenets and principles that apply to their asana practice, but there is certainly no system of movement (asana practice) that will protect everyone and every joint in the body from injury. No one system has all the answers, and to the degree that any system claims to be right, it is probably wrong a good deal of the time. It requires a fair amount of naiveté to accept that principles of movement or alignment that are useful in many instances are the be-all and end-all for organizing movement in all bodies. I think that the willingness to accept and hold too dearly a set of alignment principles in asana as right or true is symptomatic of an underlying need to find simple answers to life’s big questions. This tendency is idealistic without being grounded in the reality of how complicated and masterful the structure of the human body-mind system really is and that it may take years of study and practice to begin understand it. Believing in an idealistic vision of asana that seeks to simplify and categorize human movement into a learnable code is problematic It involves thinking that there is an ultimate reality that applies in all situations and that this ultimate reality can be fully understood and then categorized by our human mind. This belief comes from a desire to see life as much simpler and more easily understood than it actually is. If there is an ultimate reality (which I actually still feel there is), one thing you can say about it is that we as individual spinning spheres of consciousness will not ever be able to grasp it fully. If our human form is made in the image of the Universal Vastness there’s a good chance that the individual ego, “I,” will not figure out how it functions. The best we can do is take the ride, all the while increasing our awareness as we notice more of life’s essence and beauty as well as everything else life offers us: pain, suffering, illness, and death. If we are wise, we may even be able to figure out how to assist our selves and others in finding greater comfort, ease, and stability along the way. And if we are serious in our practice, over a long period of time we may even be able to begin to glimpse the radiance of it all. We, as yoga teachers, are guides in this journey. We are not the owners of the vision—no one is. Idealization—the kind that allows us to glorify, and even deify, a person or a yoga system—is a problem of naivete. If our yoga practice is working for us, we will mature and evolve beyond idealization of anything or anyone. This pretty much decimates excessive belief in a particular system and the impulse to idealize and therefore give over our personal power to another person, whether that person calls him or herself a guru or not. A guru is a guru based on how she or he acts and how people relate to her or him. If people give away their personal power to another person whom they put on a pedestal,, that person is seen as a guru. The label is not important, but the power dynamic is. The guru problem and the yoga movement systems’ problems are ones that many serious yoga practitioners and teachers have had to grapple with over the years. Many of us, myself included, have tried to go down one version or another of these paths. As I explored, I found that the more answers any system of movement or philosophy claimed to have, the more suspension of higher judgment a devoted follower needed to adopt. When I was a young practitioner, I hoped that by attaining perfect alignment and mastery of yoga asana, I would also attain a perfect body and a radiant mind. Additionally, I hoped that I might meet the guru person who could show me the way to enlightenment. Personally, in terms of asana, I decided that I would complete them all—literally check every posture off my list. It took a while, and as I neared completion—and didn’t feel that enlightenment was about to fall onto me—I began to see there might be a problem in my thinking. Fortunately for me, I could never adhere to a specific system so I did have the advantage of not having any authority to rebel against and no system to leave. One of my early and most influential asana teachers, Ana Forrest, used to tell the story of going into Iyengar’s class in Pune with a sticker on her hip that read, “Question Authority.” That message was clear and made a strong point that I never forgot in my personal journey. In terms of philosophy and meditation, I have been lucky to have never found any one person who seemed to hold all the answers, and the best teachers along the way never pretended to. Those are the teachers from whom I have learned the most. I believe that these two issues, believing too much in a system of movement and believing too much in a single person’s authority, are not separate. I think that the source of both ways of thinking can be found in a fragmentary vision of reality in which we perceive the world, our bodies, and ourselves to be composed of a collection of discreet and individual parts. This usually incorporates a hierarchical vision of life that positions some things as binaries: bad/worse, good/better, and not-so-smart/smart. Usually, we don’t like the bad parts of our lives, so we try to annihilate the bad and maintain the good. Unfortunately, this just doesn’t work. You will never be all good and neither will anyone else. Obviously, the idealization of a guru has many potential pitfalls. From the perspective of a fragmentary mind, the guru knows more than I do, and I need to defer my knowledge to him/her in order to “better myself” or perhaps to “rise” to his/her level. We aggrandize this person until eventually, in order to “progress,” or to be free of the guru’s influence, we need to knock the guru down, which is easy to do, because in fact, the guru was never any better than we. But since we are still stuck in the better-worse dichotomy, we now see the guru as “worse.” There is no end to this game, and it holds no spiritual development for anyone along the way. When we are watching someone who we have placed in a high position on this contrived scale of good to bad take a fall, our tendency is to vilify that person because we are so stuck within ourselves in the good/bad dichotomy. The idealized person, now taking the fall, is also clearly stuck in the good/bad dialogue. Otherwise, she would never have allowed herself to be put on the pedestal in the first place. The guru is not better or worse than we. This person has not suddenly been revealed to be “bad.” He is just like me and just like you, and without an expanding vision that is a pretty difficult position to hold because that would make you and me bad too. To break out of this thinking, I need to go deeply inside myself and see that I too am good/bad and everything else in between, all the time. That is not such a comfortable realization for a person who tends to idealize anything! To the degree that I put my guru down, I am limiting the opportunity to go deeper within myself and accept more of my own humanity with all of its so-called faults. The problem of idealizing the teacher as a guru is one that many serious yoga students will have to address. Because yoga is a spiritual practice, the tendency to idealize the teacher and to believe the teacher has great knowledge or power is strong. As yoga students who are also yoga teachers, we have the responsibility of not allowing ourselves to be placed in the position of a revered guru. We need to be mindful of our role in this power dynamic. This pattern of idealization will happen again. It will, because we inhabit an imperfectly perfect universe. Accept it. We all have a tremendous responsibility to do the best we can to act with integrity. It is key to a deep practice. In order to really act with integrity, you need to accept all aspects of yourself. Without accepting the unwholesome aspects of yourself as well as the more desirable qualities, you may find that you act on them before you even notice what you are doing.. By accepting all of the aspects of yourself and airing them in the clear light of consciousness, you gain real choice and thereby you can make good choices. Denial of the unsavory corners of our psyche does not free us of them. The thoracic (breathing) diaphragm is a broad, thin, double domed muscle with insertions around the circumference of the lower rib cage, the spine, and the lower portion of the sternum. It spans the thoraco-abdominal cavity and contains a strong central tendon, the left and right parts of which insert into one another. The thoracic diaphragm is the main muscle of the breath, and it is said that its movement is responsible for 75% of the respiratory airflow. The accessory breathing muscles are responsible for the additional 25%. 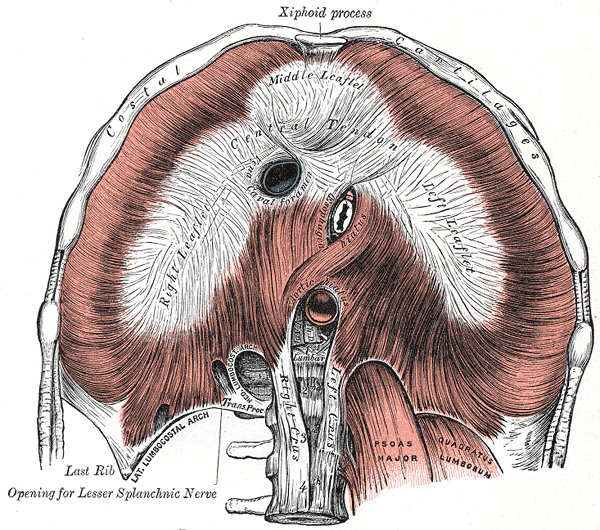 The diaphragm separates the heart and lungs above from the abdominal organs below. The heart rests on the central tendon and is connected to it by the pericardium. The heart rises and falls with the movement of the diaphragm, as do the lungs. The diaphragm is the seat of the heart and lungs. It massages, rolls, and squeezes the abdominal organs as it moves. This movement contributes to health and suppleness in the organs as they are bathed in fresh blood and fluids.